Picture it: you’re binge watching your favourite show on television when suddenly, out of the corner of your eye, you spot movement. Focusing in a little, you discover that your house is now home to not one, not two but four house flies! At certain times of year—end of summer being one of them—flies tend to flock, having grown in number over the hot weather months, so that even holding the front door open a little too long can result in a few unwanted guests. The common house fly only reproduces during warm weather, in a 7 to 14 day cycle from egg to adult, so that by the end of the season, there is quite an abundance of them! One female fly can lay up to 900 eggs in a season! Beyond being pesky, however, is the fact that flies can carry diseases including E. Coli and salmonella, so getting rid of them is a priority. How do flies get into your house? The first and most obvious way is through openings that aren’t protected with screens. Doors left open by kids who think they live in a barn; windows without screens or with screens that have holes in them, thanks to the dog who forgot there was a screen when it lunged at a cat; cracks around windows and walls. The possibilities are many! When they get in during the summer, or even when they’re hanging around just outside, their favourite place to lay eggs is your garbage cans so keep those as clean as you can to avoid an infestation, including using a disinfectant spray. Flies thrive in bacteria laden places so the less bacteria, the less flies. They are looking for a source of food, so one key is to not give them one. They are attracted mostly to sugar based foods and meats so any trace of these on your garbage cans won’t help, and make sure foods are properly put away and not left sitting on the counter. Another attraction is pet food so make sure you put away those dishes when Fido is done his or her evening meal! How can you get rid of flies once they’re in? Flies are drawn to light, so once they’re in, they will typically head for windows. Since those are likely closed, they can’t escape, but it’s a good place to put fly strips if you want to use those to catch them. If you’re not keen on the commercial chemical based strips, try some homemade natural ones! Get some cardboard and cut it into strips, with a hole punched at one end and strings run through for hanging the strips from. Paint the strips with a mixture of golden syrup and sugar and let them dry, then hang them near windows and doorways around your home until you’ve caught the rogue fliers! A good old fly swatter will work as well, but don’t forget to spray disinfectant where you killed them, to avoid any bacterial residue. A vinegar trap will also work: simply fill a glass container with apple cider or malt vinegar (something sweeter smelling than white), a little bit of sugar, cover the container with a plastic baggie or plastic wrap and secure that with a rubber band. Then cut a hole in the top of the plastic big enough for a fly to crawl in but difficult for them to crawl back out of! How do you manage this last bit? Push the bag down into the glass container a little so that it is funnel shaped. You can also make a funnel out of paper by rolling it into a cone shape and placing it on the top of the container. You can also try this same technique but with wine and dishwashing soap. The flies will be attracted by the wine but when they drink it, the soap will do them in. Again, use a funnel to get them into the container and prevent them from getting out again. What doesn’t work? Traditional insecticides aren’t particularly effective given the short reproductive cycle: you may get the adults, but they could have laid eggs in several places, which won’t be affected. Worse still, their eggs can lay dormant through the colder winter months, only to hatch and begin the cycle again in the spring! Insect light traps do work but aren’t pleasant to have in the house and are better for porches or other outdoor area near the house. 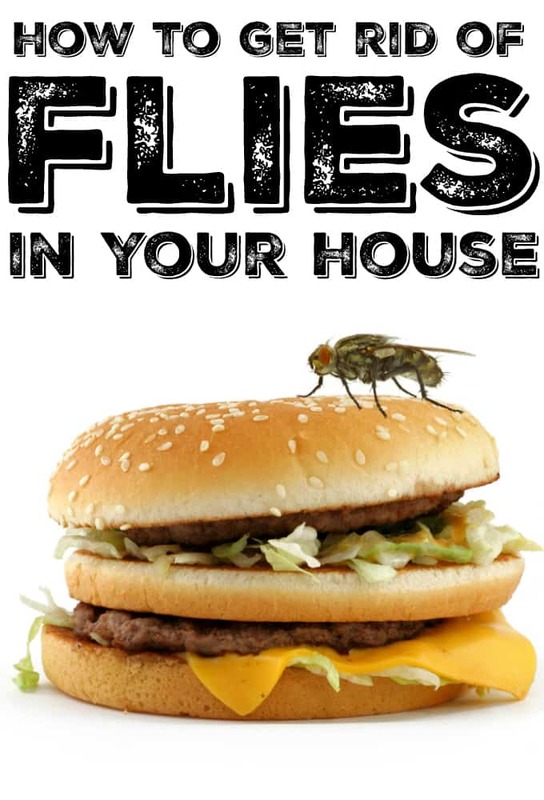 You can prevent flies from getting in by making sure all your screens are in good repair, cracks around door and window frames are filled, weather stripping is installed and your garbage cans are covered and far enough from the door to avoid the flies finding their way in as you go out! Animal feces is a big attractor, so be vigilant about pooping and scooping, even in your own yard. Get a large plastic bottle – water or pop bottles, for example, and cut the top third of the bottle off. Put about an inch or two of a mixture of honey and water into the bottom part of the bottle. Invert the top ⅓ piece and place it into the bottom part of the bottle, creating a funnel. Place your honey trap outside your window or door and you’re done! Also, flies don’t care for strong smelling plants so placing pots of herbs like basil, mint, lavender or bay leaf near doorways will help to keep them at bay. Essential oils work well in this capacity as well, particularly eucalyptus or lavender. If you place some on fabric strips that you hang near windows and doors, you’ll find less flies making their way in. Fresh orange peel, with the citrus essence, can also be helpful to keep flies out, but it must be fresh to be effective so get to eating those oranges! Do you have tried and true ways of getting rid of flies? I love the DIY fly strips, I will have to give them a try! A great article, luckily I don’t get many flies and a fly swat works well for me. It’s spiders I want to discourage from even attempting to enter! One way of getting rid of flies is to chase them with a mini vacuum and pretend you’re one of the Ghostbusters! We have a pretty gross amount of flies in our basement right now, so I read this post with great interest! They come in on our firewood, which we put into our basement early this year, and with the super warm September we’ve had, I think we were just asking for trouble! I’ve been putting up the fly strips (store bought) but I’m definitely going to try these natural ones. The good thing is, even though there are so many of them, they don’t seem to want to leave the two windows that are in our wood room. We had to vacuum out the flies from one of the windows, since it is not convenient to put up the fly traps near it because of the wood piles. (My poor husband had to climb up on the wood pile though, which really didn’t look fun) We were then sure to clean out the vacuum afterwards. Thanks for the tips! I use fly strips and make sure that I keep the doors and windows in good shape so flies can not get in. I hate flies. They are nasty and dirty. I use the tried and true fly swatter if they get inside! I was wondering if the penny in a ziploc bag of water works? Nice tips, should’ve seen this earlier. I know I live in the country. The neighbors cattle graze in the pasture next to our back porch. They aren’t really close either but they draw flies like crazy.